As we all know that there are nine planets in our solar system and the Venus planet is one of it. If we come to see the position of Venus planet than it is the second planet in our solar system from the sun which use to orbit the sun in every 224.7 Earth days. 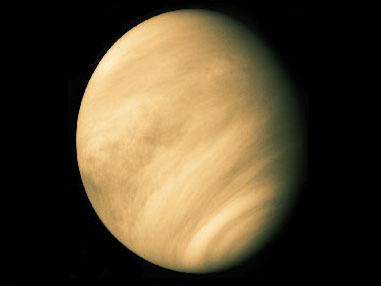 The name of the Venus planet is derived or named from the Roman Goddess of love and beauty. Venus planet can also seen from the earth’s surface because it is the second brightest natural and heavenly object in the sky after the Moon reaching an apparent magnitude of -4.6 which is bright enough for casting the shadows. Planet Venus is an inferior planet from the Earth which never appears to venture far from our Sun whose elongation reaches the maximum of 47.8 degree. Planet Venus use to get much brightest during shortly before the sunrise and shortly after the sunset therefor this planet is also known as the Morning star and the Evening star. 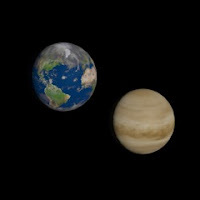 If we see the classification of the Venus Planet than this planet is classified as the terrestrial planet and sometime also called as the Earth’s Sister Planet because of the similar size, it’s gravity and the bulk compositions. This planet is covered with the opaque layer of highly reflective clouds of sulfuric acid which prevent to see the surface from space in visible light. In our solar system the planet has the most densest atmosphere than the other terrestrial planets which consist of more carbon dioxide. As there are huge amount of carbon dioxide but the planet has no carbon cycle for locking the carbon back into the rocks and the surface features therefor nor it does seems to have any kinds of organic life for absorbing this in biomass. It is also believed that when the Venus was younger than it had Earth like oceans but all of these get evaporated due to the rise in temperature. If we see the surface of the Venus planet than it has dusty dry desert scape with lots of slab like rocks, periodically refreshed by the volcanism. The water in Venus Planet is most likely dissociated. Hydrogen has been swept into the interplanetary space by the solar wind due to the lack of the planetary magnetic field. The pressure of the atmosphere or the atmospheric pressure at the surface of Venus planet is 92 times that of Earth. Venusian surface was a subject of the speculation until some of the secrets were revealed by the Planetary science in Twentieth century and this was finally mapped in the detail by the Project Magellan in 1990-1991. It is also found that the ground shows the proof of extensive volcanism and present of Sulfur in atmosphere may indicate that there have been some of the recent eruptions. However the absence of the evidence of the lava flow accompanying any of visible caldera remains and enigma. It is also found that the Planet Venus has few impacts craters demonstrating that the surface is relatively young and it is also found that approximately the planet is 300 to 600 million years old. There are not any evidence for the plate tectonics, due to its crust is too strong to sub-duct without the water to make it less viscous. Planet Venus may lose its internal heat in the periodic massive resurfacing events. The planet Venus is also called one of the terrestrial planet out of the four planets in our solar system because of it’s rocky body as the Earth have. The size and the mass is similar to the earth and Venus is much similar to the Earth, therefore it is called or described as the sister of Earth or Twin. If we compare the diameter of the Venus Planet than it is only 650 KM less than that of our Earth and the mass is about 81.5% of our Earth. Due to the presence of dense carbon dioxide atmosphere the Venusian surface is radically differ from the Earth’s surface. Mass of atmosphere of Venus Planet is 96.5% carbon dioxide with the most of remaining 3.5% being nitrogen.